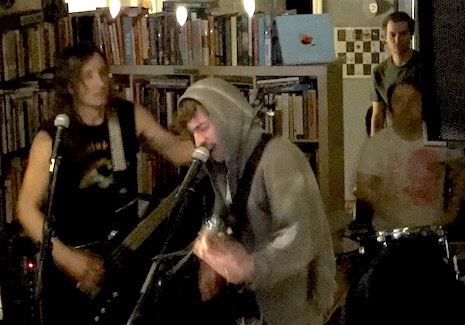 Rusty Lord at Almost Music during Record Store Day, April 21, 2018. The shop will be closing its doors in January. If you haven’t already got the news let me be the last to tell you that yesterday Brad Smith announced on Facebook that Almost Music will be closing its doors forever in January. Seems like only yesterday (instead of nearly three years ago (April 2016)) that Almost Music moved to the Blackstone District from its original Benson location (65th & Maple), which opened in October 2013. Almost Music for me was a connection back to the old Antiquarium days, to the ’90s Omaha music scene and old friends like the long-departed Dave Sink. Almost Music had that same Antiquarium vibe. It was a neighborhood store that welcomed anyone, but beyond that for music fans, Brad and his staff just made it easy to buy stuff. The difference between Almost Music and other record stores was the way the stock was curated, so the good stuff bubbled to the surface and was easy to find. I get exhausted just thinking about having to dig through stacks of dirty, dusty vinyl at Kanesville or the endless used bins at Homer’s looking for hidden treasure. Brad put the treasure right out front, clean and in perfect alpha order. I’m speaking in past-tense. Almost Music is still open and will be through the holidays. I suggest you drop by with your wallet or credit card and take advantage of it before it’s gone for good, along with the remaining fond memories you had of Omaha’s past. Chicago indie band Typesetter headlines tonight at fabulous O’Leaver’s. Joining them are fellow Windy City act Kali Masi and Omaha’s Centerpiece. $12, 10 p.m. While you’re in Benson, tonight is the OEAA Nominee Showcase. Your $10 gets you into three venues — B-Side, Barley Street Tavern and Burke’s (all the “B” bars!) to check out bands nominated for this year’s awards. More info here. Meanwhile, tonight down at Slowdown Jr. indie experimental instrumental duo El Ten Eleven headlines. Their latest, Banker’s Hill, was released this year by Top Shelf Records. Indiana band Thunder Dreamer opens at 9 p.m. $14. Saturday The Omaha Bug Symposium is happening at OutrSpaces, 1258 So. 13th St. Says the press release: “It’s a mixture of science, art and music that we’ve been doing for the past five years. This year’s musical guest is Wrong Pets.” Starts at 8 p.m. Tix are $10. Also Saturday night DMX (The Dereck Higgins Experience) headlines at O’Leaver’s with Dead on Dust and Bound. 10 p.m., $5. Finally Sunday is the big 15 Passenger Records showcase at The Waiting Room featuring Cursive and Campdogzz. It’s been awhile since Cursive, who’s out touring their new album Vitriola, has graced an Omaha stage, and never with this new line-up (that includes the return of Clint Schnase on drums). Chicago’s Campdogzz saw the release of their latest album, In Rounds, this year on 15 Passenger, which, as we all know, is a label run by the guys in Cursive. Fellow Chicago act Meat Wave opens the show at 8 p.m., $15. 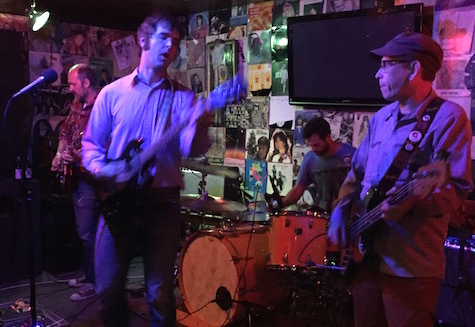 The Lupines at O’Leaver’s, Sept. 19, 2015. The band returns to O’Leaver’s tonight. …starting tonight at fabulous O’Leaver’s where Lupines headline. Also on the bill are Lincoln bands Laughing Falcon and Falling Distance. $5, 9 p.m.
Saturday night’s main event is London indie folk band Daughters (4AD Records). The band’s most recent album, Not to Disappear, came out in January, which Pitchfork said “… spans that gap between the very real drudgery of everyday life, and the more potent stories we tell ourselves when times are bleak.” Rating: 6.7. I try not to miss 4AD bands when they come through town. Opening is Vancouver Sleep Clinic (Sony), described as a “rising Australian singer, songwriter and producer.” Where’s the Canada connection? $16 Adv/$18 DOS. 9 p.m.
Also Saturday night, Jason Meyer’s new band Wolf Dealer plays O’Leaver’s. Says Jason: “Wolf Dealer is a rock music band made up of old guys that have been in a bunch of local bands. Talking Mountain, Sun-Less Trio, Carsinogents, Virgasound, Skull Fight, Fonzarellies, Thuggs, the Cuterthans.” What more do you want? Also on the bill are The Vahnevants (Des Moines), Haunted Gauntlet (M34N STR33T/ex-Oh Possum), and the Afghan Hounds (Lineman’s Rodeo).. $5, 9:30. Sunday night post rock duo El Ten Eleven headlines at Slowdown Jr., with Bayonne and Fontenelle. $12 Adv/ $15 DOS. Early 8 p.m. start time. Also Sunday night La Bouvette in the Old Market is hosting a show — yes, that La Buvette. The lineup is Dunwoody & Son, David Ozinga, The Lazy Wranglers and Sean Pratt & The Sweats. The free show starts at 8 p.m.